See Hear filmed the show at our opening weekend. You can watch again now here on iPlayer. It’s a lovely piece (thanks See Hear honeyz!) featuring the cast, director-turned-understudy Gemma Fairlie, producer Michelle Owoo and myself in a sling. Presenter, Memnos Costi brought his family to see the show. Seeing it all looking so great on TV cheered me up following the latest hospital news on my broken shoulder. The doctor banned me from acting in Bee Detective for the rest of the tour. I’ve seen the physio therapist too and he said I shouldn’t even attempt to devise a more static, less physical version of Sophie Bee. Sophie Woolley - ex bee. I’m trying to steel my nerves and look on the bright side. 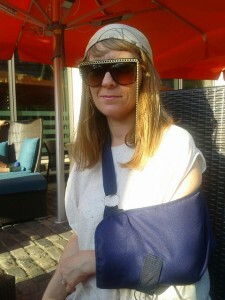 The good news is we have a great show and I will make a full recovery eventually. 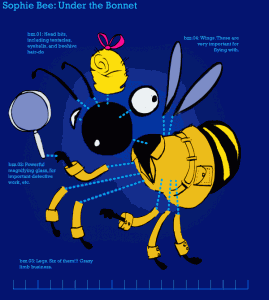 Michelle and I have been writing to deaf groups, parents of deaf children and deaf parents in Cardiff, Northumberland and London in the hope that they will come and see Bee Detective – a totez accessible show with full captions, a signing cast and pots of stupendously classy animation by James Merry. Here are the dates and booking links. Please help us to spread the buzz! CARDIFF Unity Festival 23/24 June (shows at 11am, 1.30pm 4pm). WMC. ALNWICK garden, Northumberland 14/15/16 July (shows at 11am, 1.30pm 4pm). LONDON Unlimited Festival 31 August, 1 & 2 September at Southbank Centre (shows at 11am, 1.30pm and 4pm).